Or two miracles? One on top of the other! 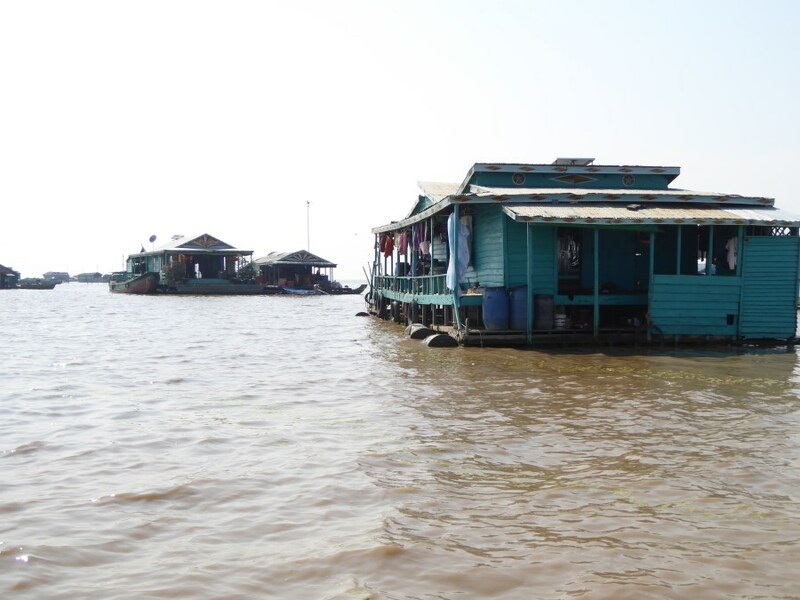 The lake, Tonle Sap. And the people that live on the lake. Check out the map. 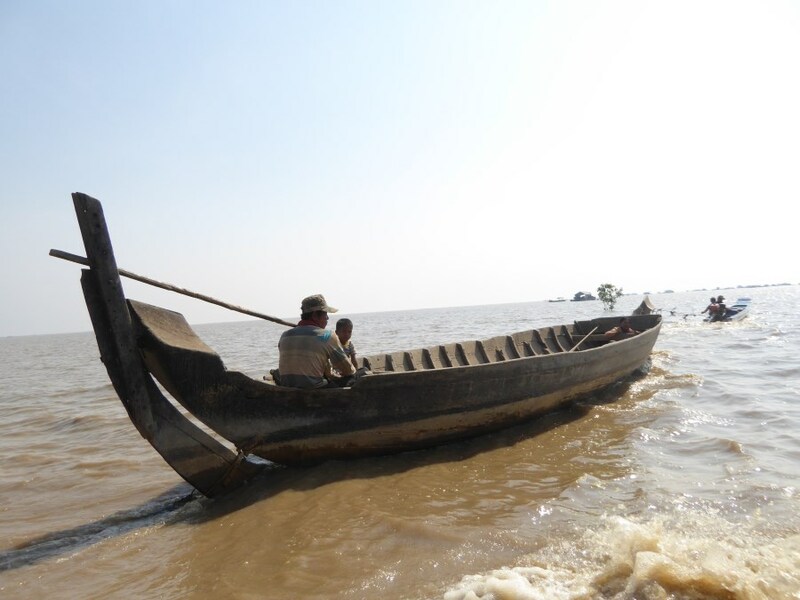 The Mekong River rushes from Tibet, through China, Laos, Thailand, Cambodia and Vietnam, all the way to the sea. 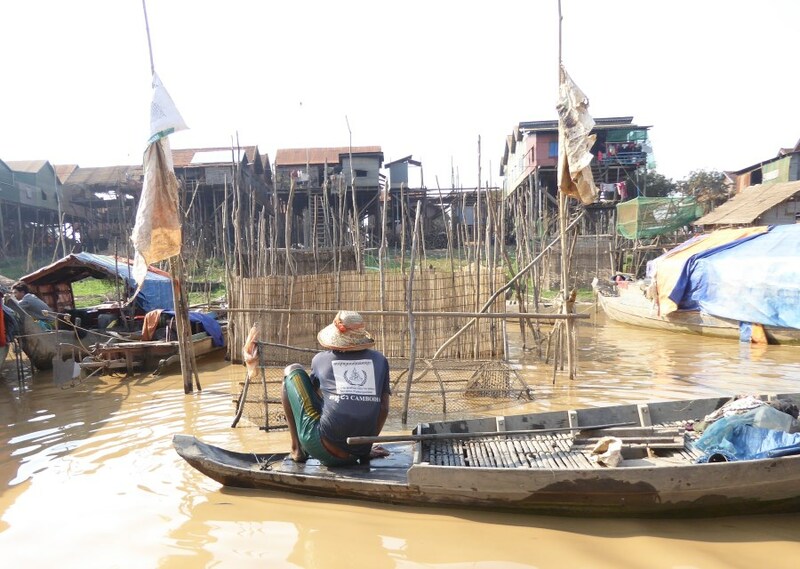 When the snow melts and the monsoon rains, the Mekong bursts with water. So much water. It simply can’t gush into the sea fast enough! 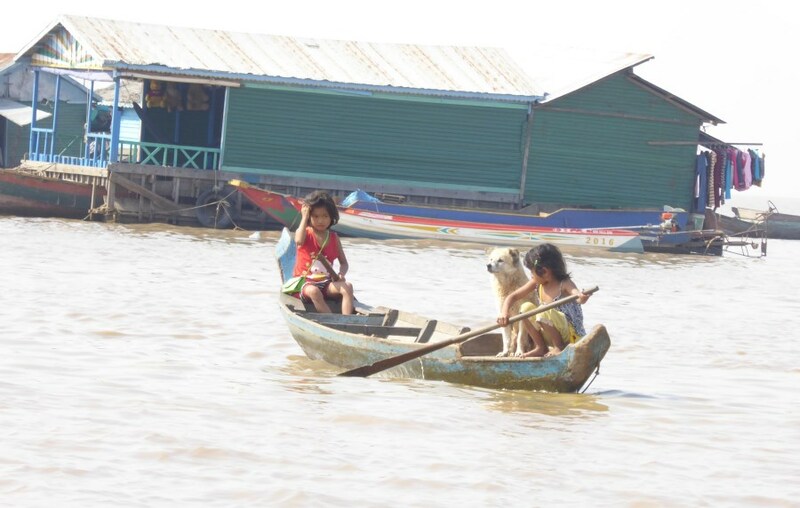 So centuries ago, the Mekong fits itself with Tonle Sap. A river and a lake. Actually it is a pipe, a pond and a pump! 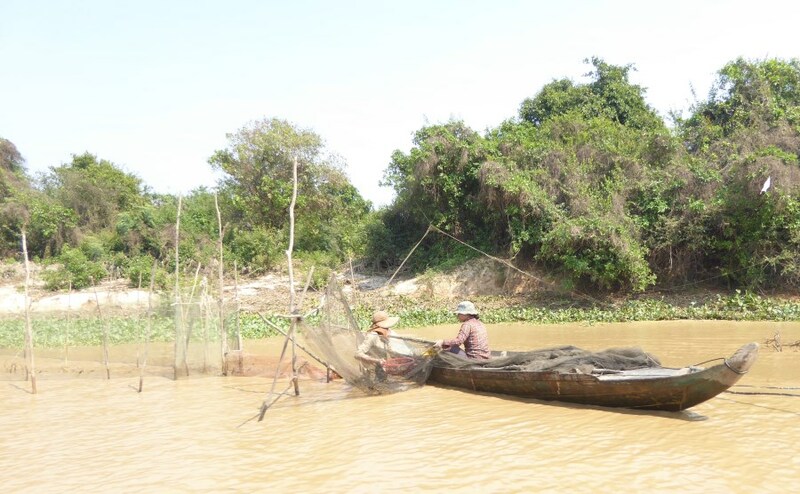 The Mekong backs up into the Tonle Sap. 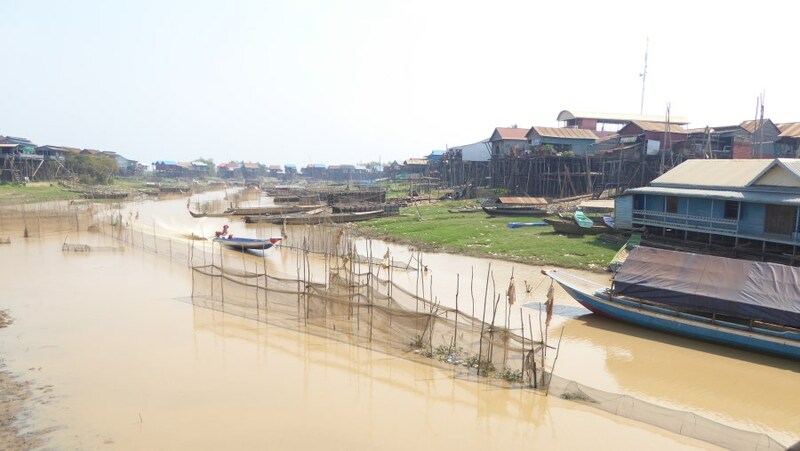 And the Tonle Sap becomes a sponge and a sump! For 6 months. The pipe of a river is 120 km long. Water flows uphill (!!) for 6 months and downhill for 6 months. And the sponge of a lake grows from 2,500 to 16,000 square meters. More than 6 times its size! 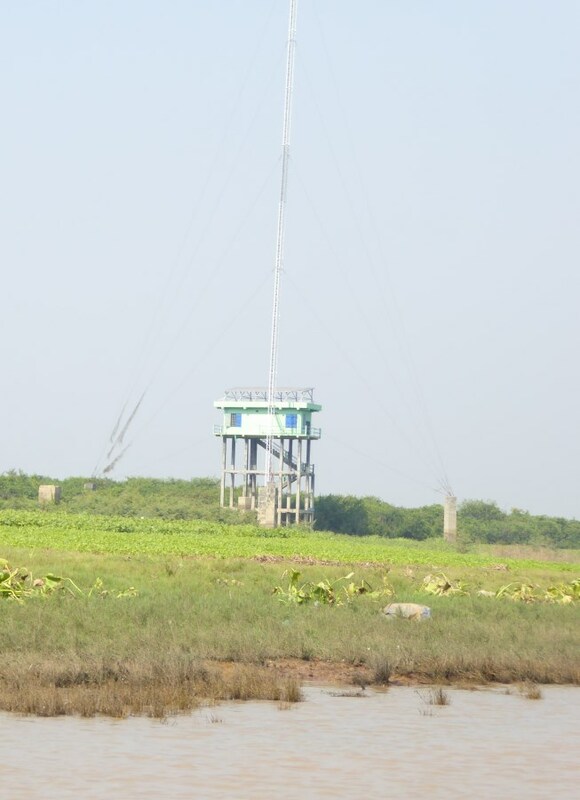 Its waters rise to 14 meters, drop to 2 meters and then rise to 14 meters again. 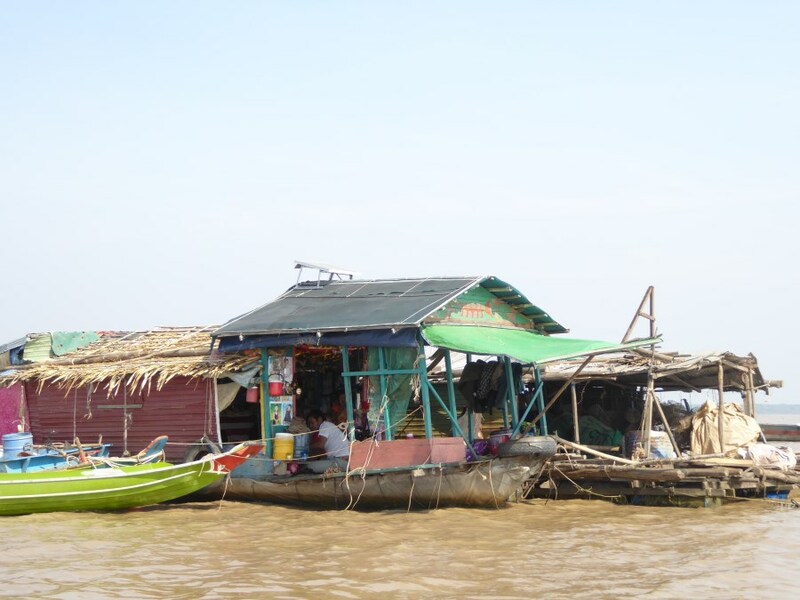 Tonle Sap is a unique hydrological system. 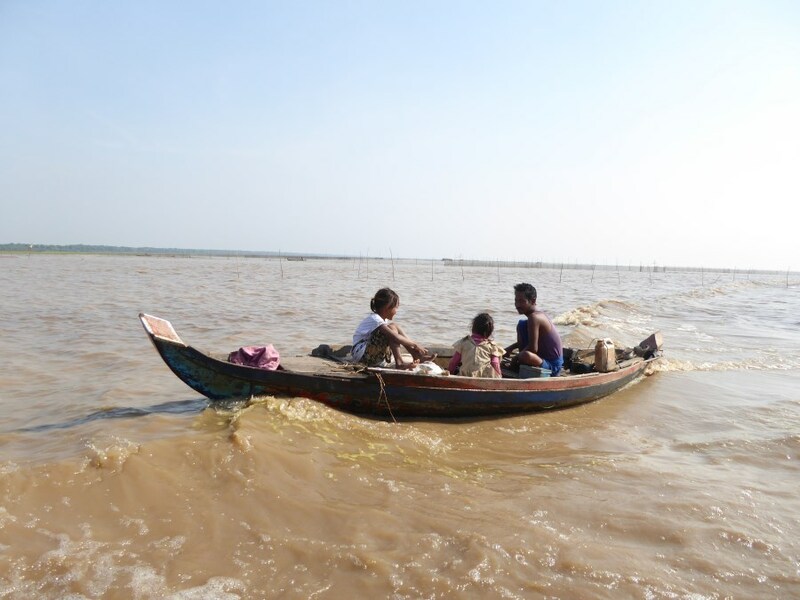 And in this ever changing world of water – people live! 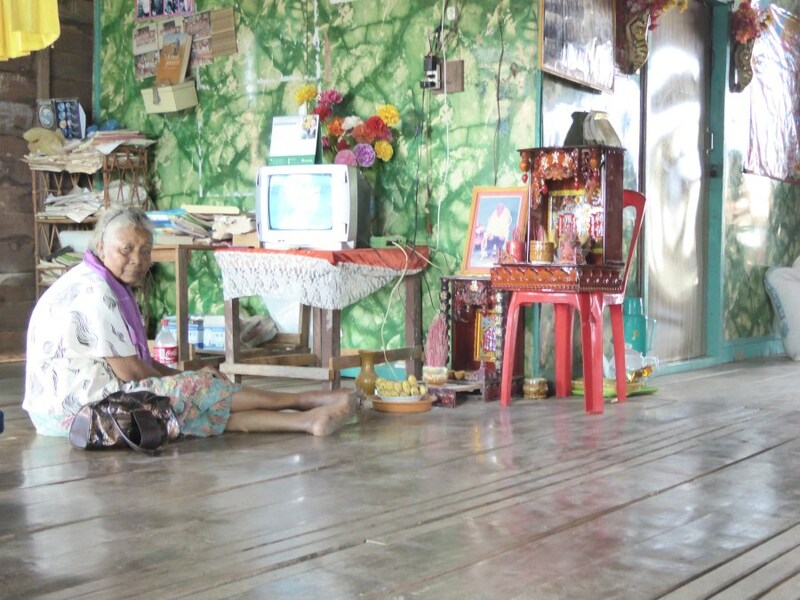 We visit the village of Kampong Khleang. 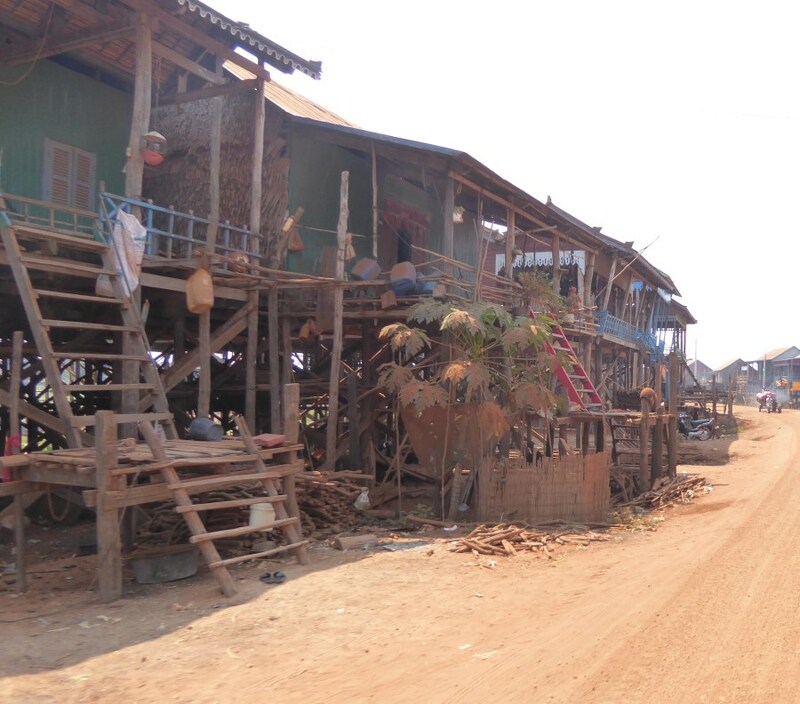 Here, miraculously, about 8000 families live. We marvel at! We wonder how? 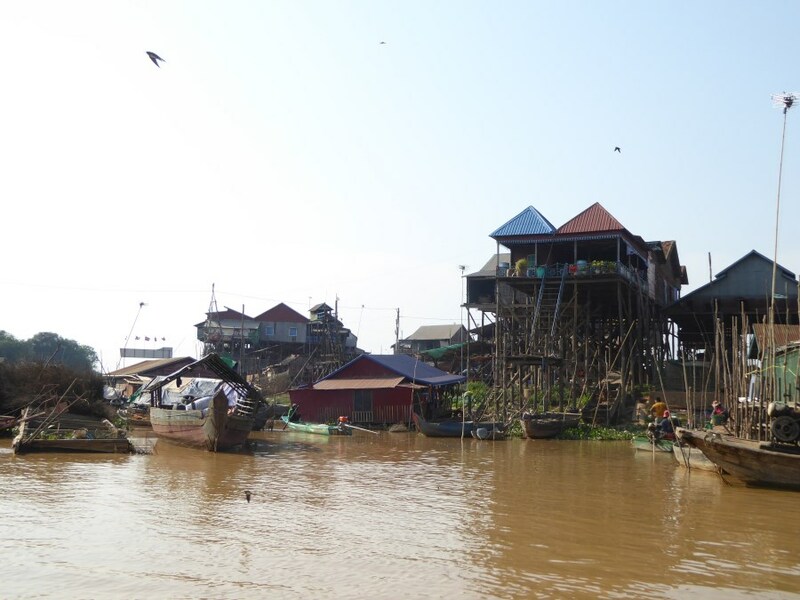 • Some live in stilted houses; sometimes 14 meters high and dry and sometimes 2 meters low and wet. 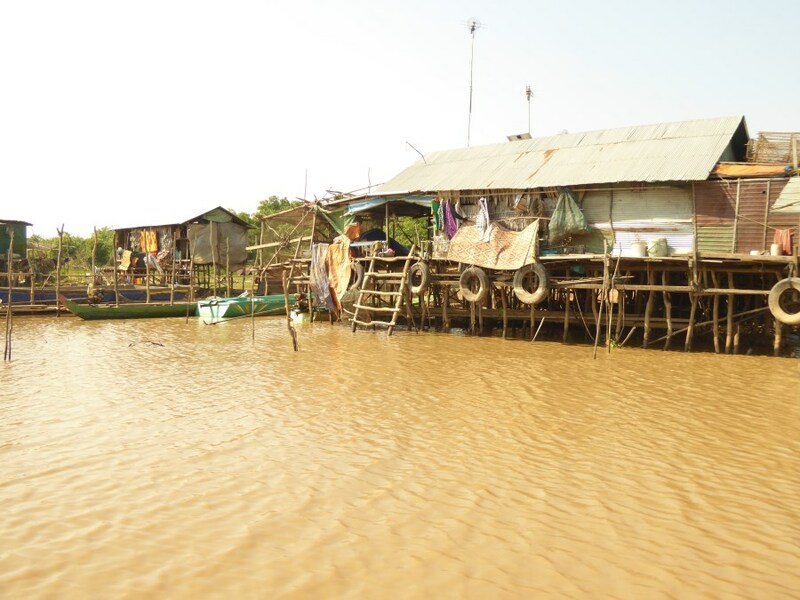 • Some live on land for 6 months and float on water for 6 months. • Some float on water all year round. 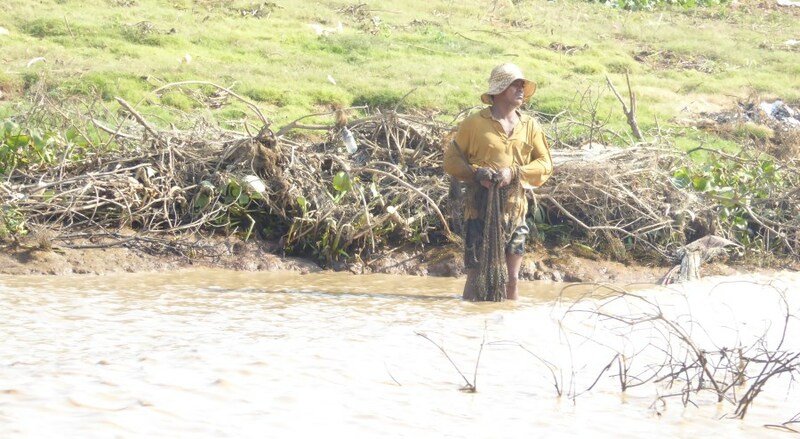 Most fish for 6 months and then farm for 6 months and then fish again for 6 months. The impossible made possible. The unbearable made bearable. It’s a miracle! Period. 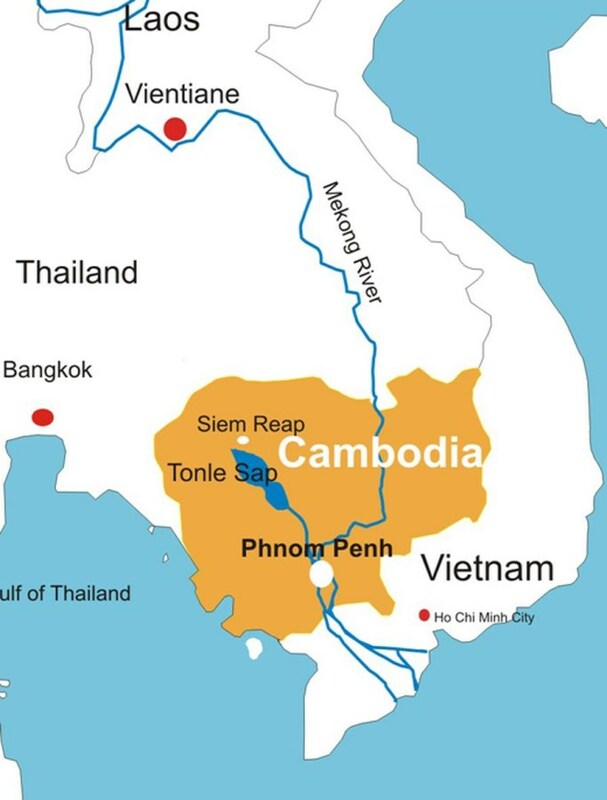 This map shows the Mekong River run through Cambodia. 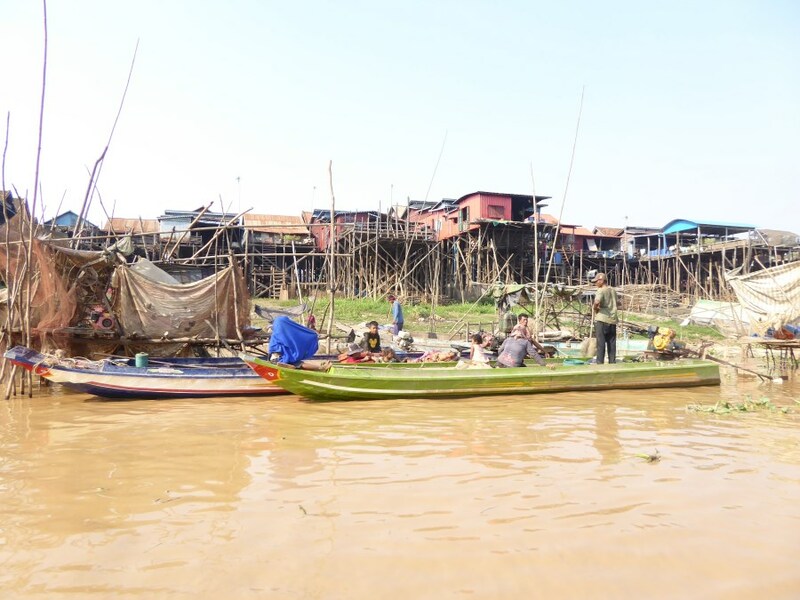 At the capital, Phnom Penh the Mekong is so full it backs up into the lake, Tonle Sap for 6 months! 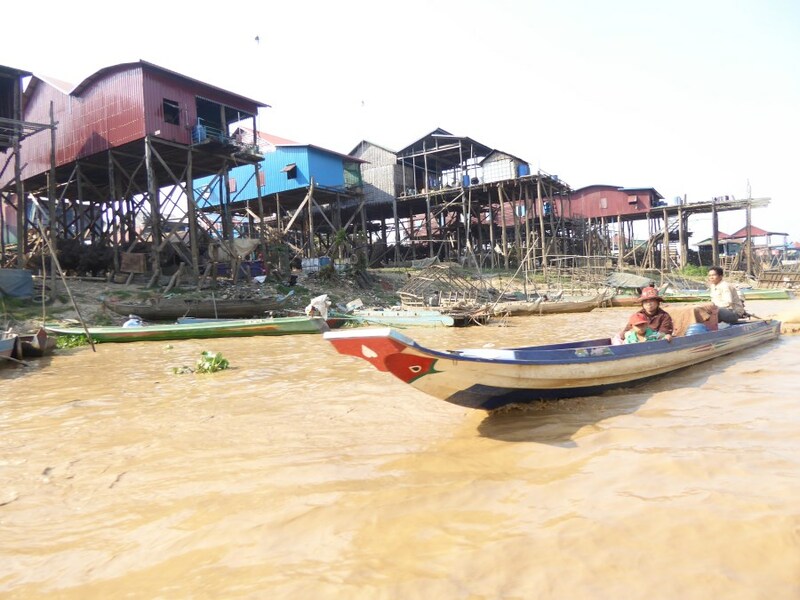 This first set of photos belongs to the community that lives in stilted houses all year round; sometimes high above the water and sometimes not. 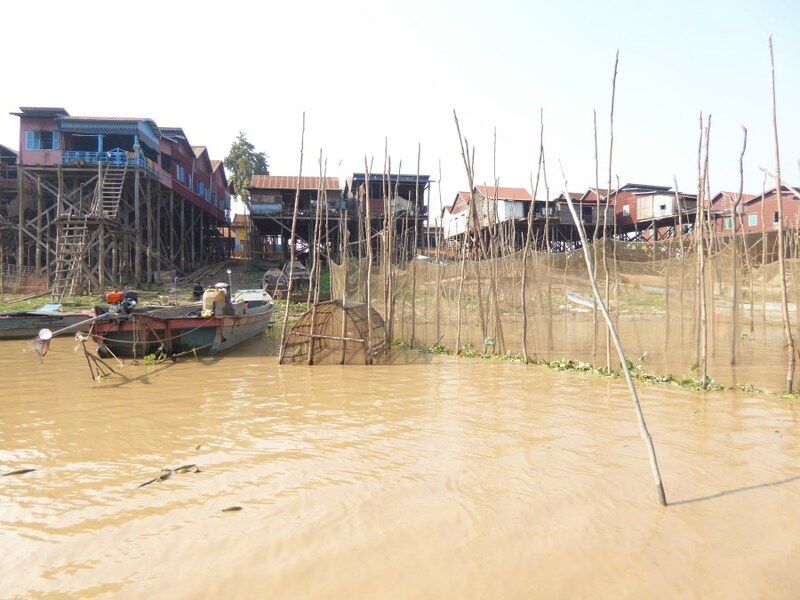 When the Mekong River runs out again it leaves this community of 8000 families high and dry for 6 months! When we are here the water is not at its lowest level. 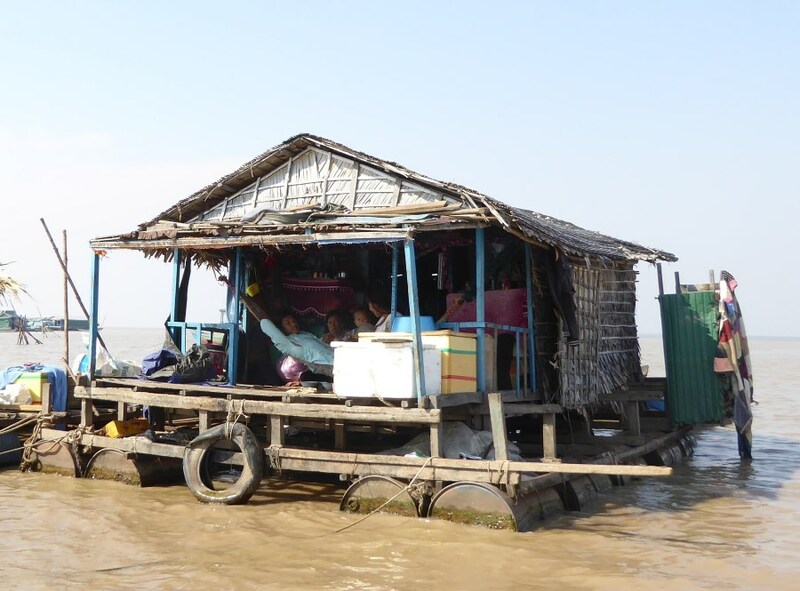 At its most extreme there are 14 meters between the water level and the floor of a house! So in 6 months time this bridge, and more, will be totally underwater! This road will also be totally underwater. Harry and I are struck by how dusty everything is … it would be … the bottom of a dry lake. … and a petrol station … although in 6 months time these petrol tanks and depo will be afloat! 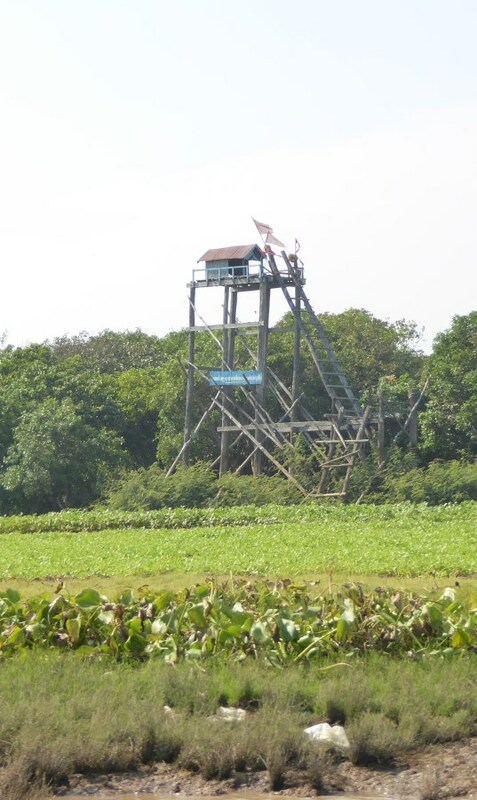 We too have lunch high up on stilts. And all these greens and herbs find their way onto our plates. This lady has lived here all her life. With the help of her daughter they make a little extra serving lunch. 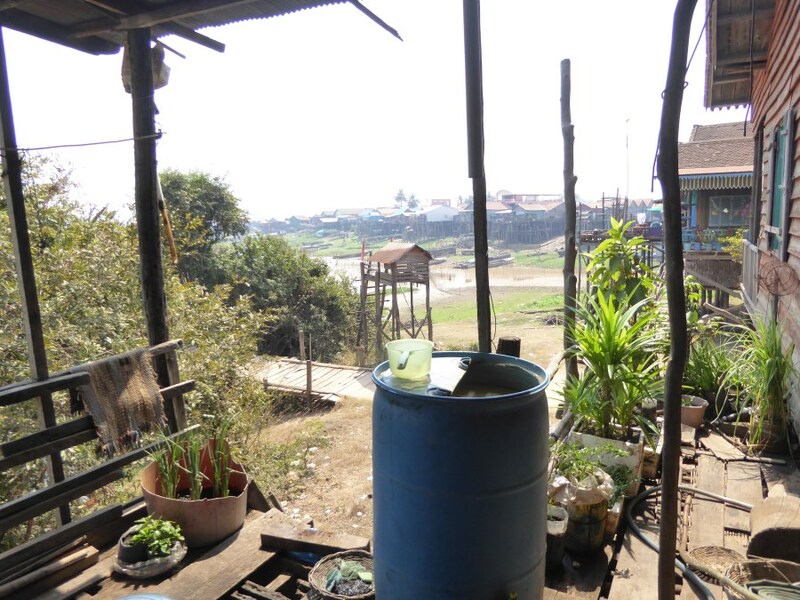 On the wall of her home we see these photos … showing the view from her window 6 months apart. The red roof top-right is a good reference point. 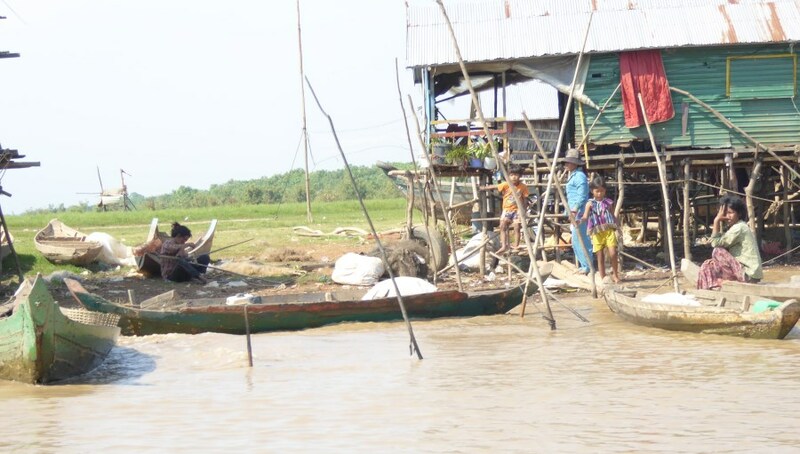 This second set of photos belongs to the community that lives on land for 6 months and then floats on water for 6 months. 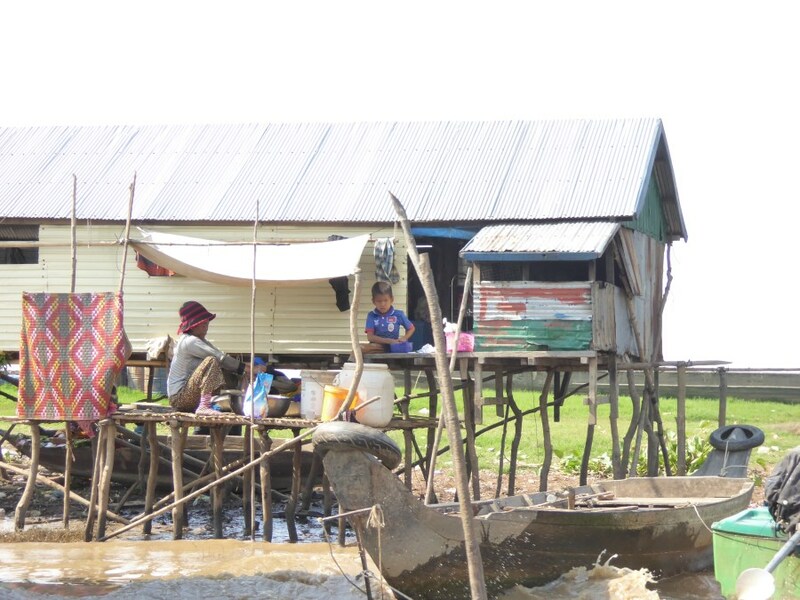 Some families build temporary houses on land when the water is low. 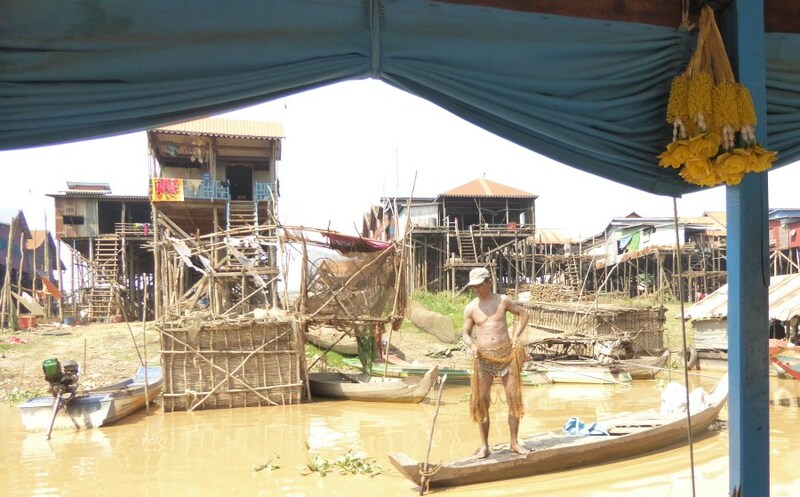 Houses are fitted with short stilts. 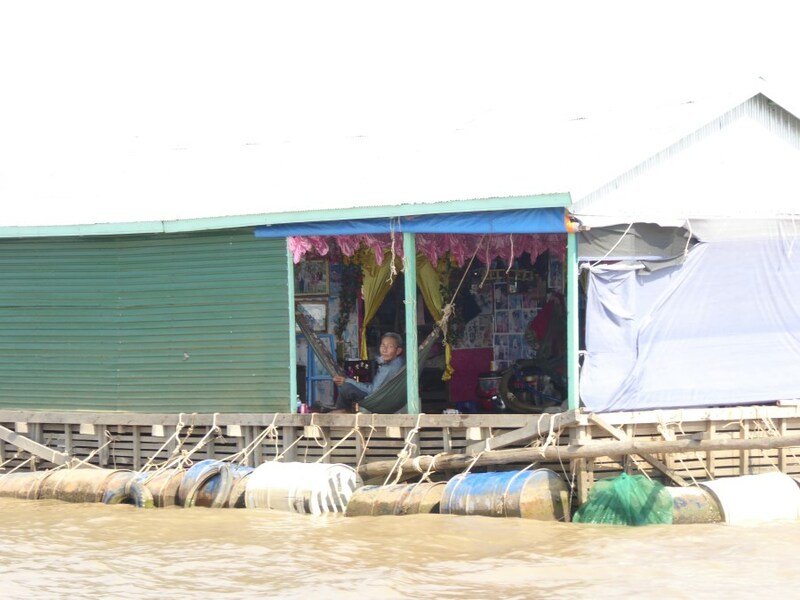 When the water rises the family parks their boats under the house and they float for 6 months! 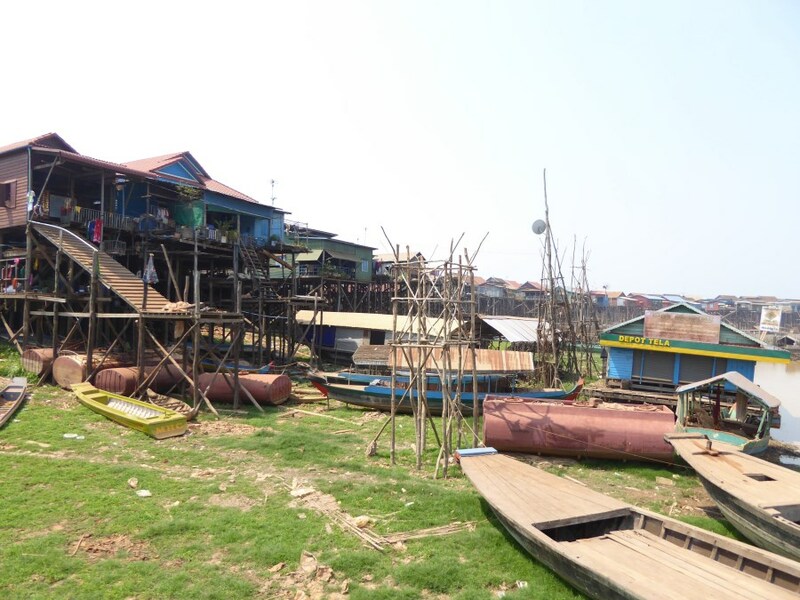 Here you can imagine how these short stilted houses are transformed into floating houses. The boats act as pontoons. 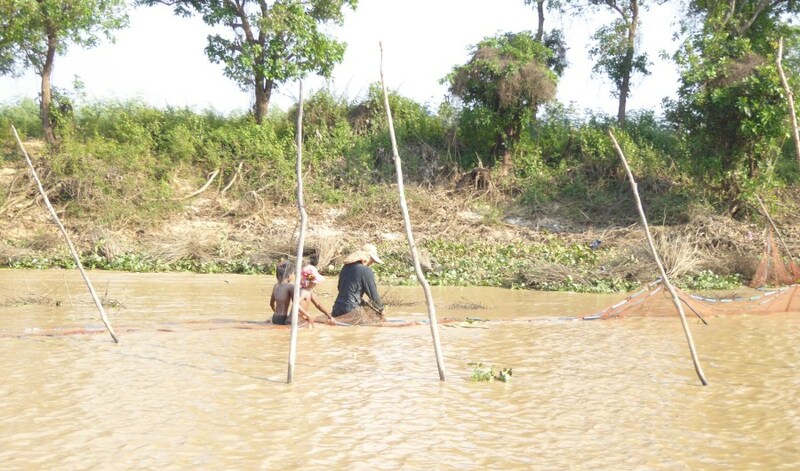 This arrangement allows these families to farm, when the water recedes and reveals these fertile soils. See how green it is with beans. This third set of photos belongs to a community that floats all year round. 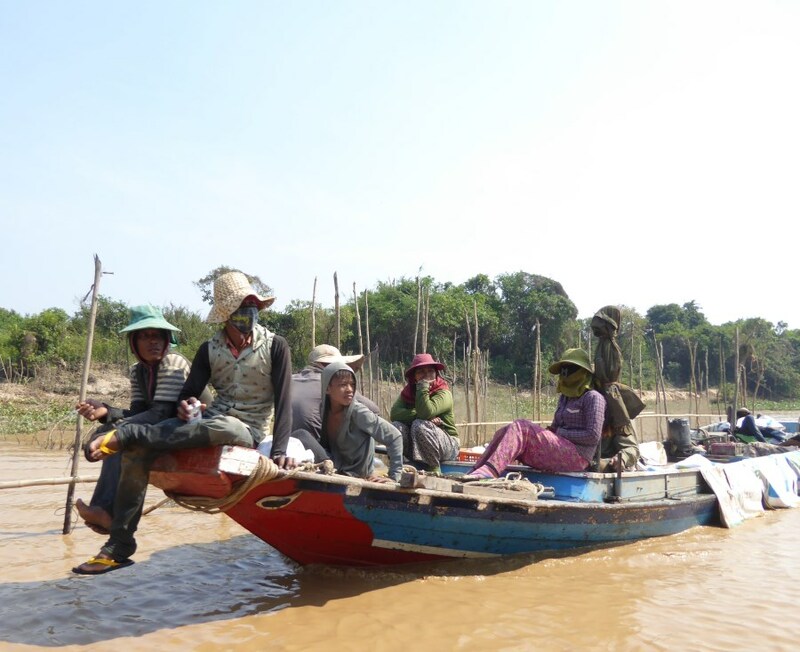 They are Vietnamese and have no claim to land in Cambodia. 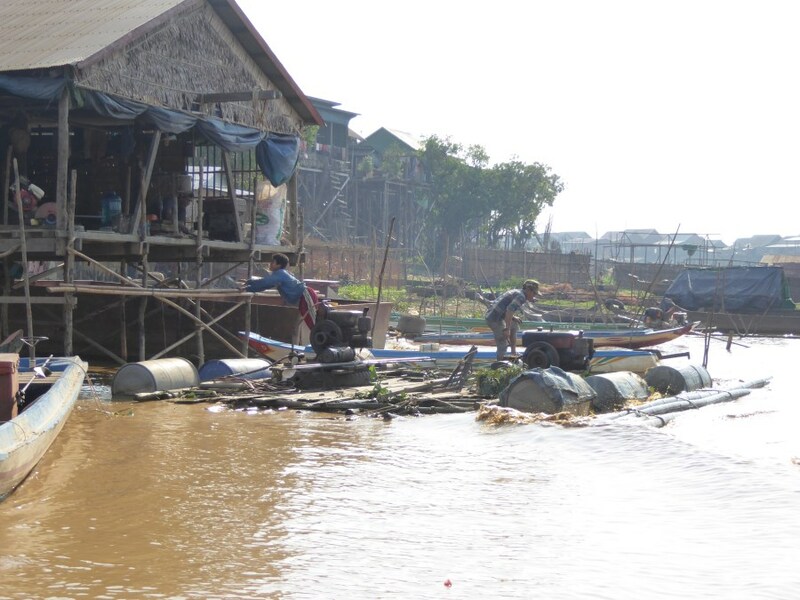 We head off, in our own boat, to the Vietnamese floating village. You can see it in the distance. 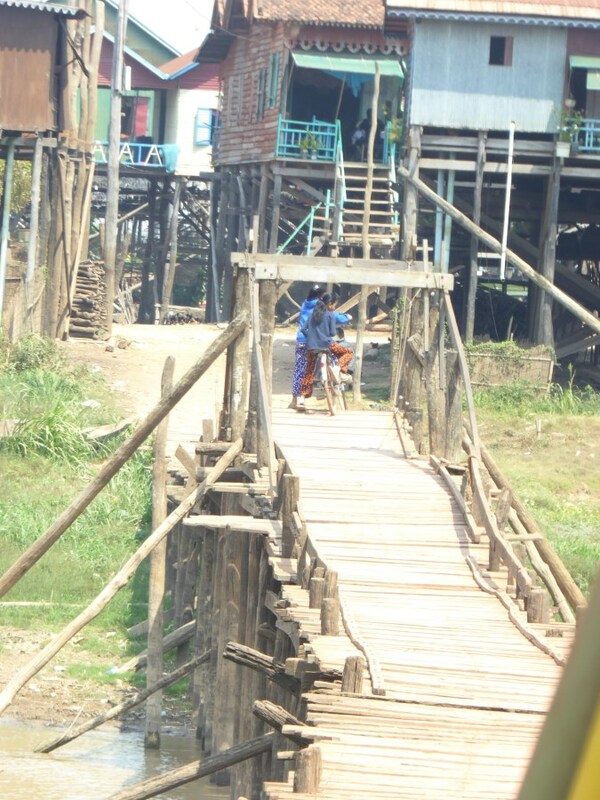 Alongside us is a merchant of dry goods also on route to the floating village. 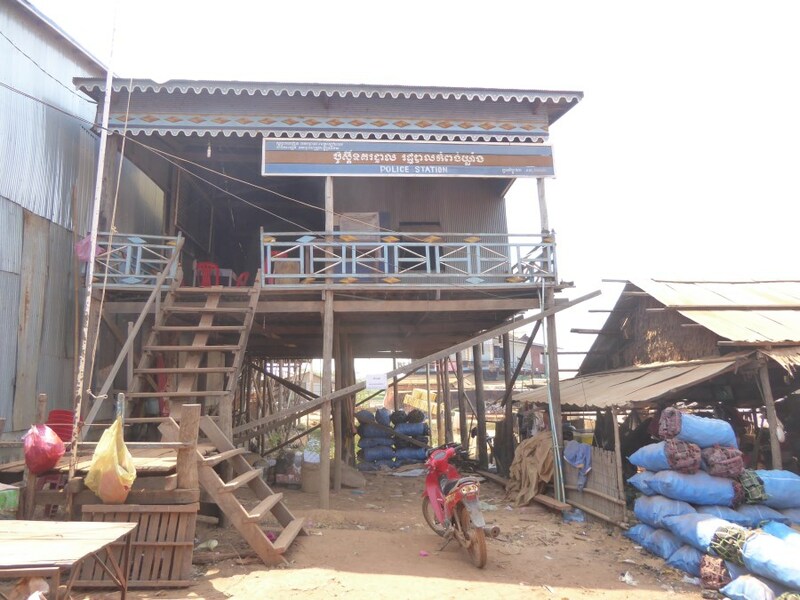 … here is a donor funded school … and we are told there is a karaoke bar too. 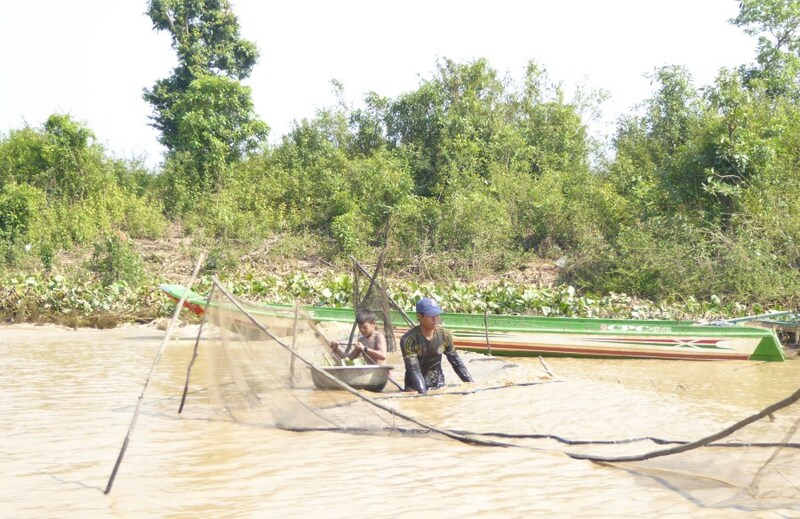 These last photos show how miraculously these communities get on with fishing and farming and then fishing again. 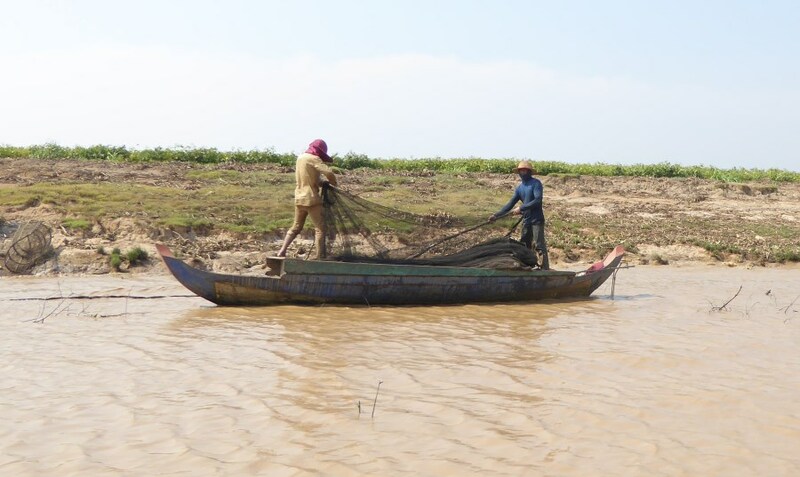 However and wherever they live … they work hard … at being fishermen or farmers or both. And we also see some very impressive irrigation schemes! They make it look so easy … walking on water … but we are sure it is not. Another gem of a report about something very few people must know of or experienced. Absolutely fascinating that this lifestyle still exits. I can only imagine it must have been a trek to get there? 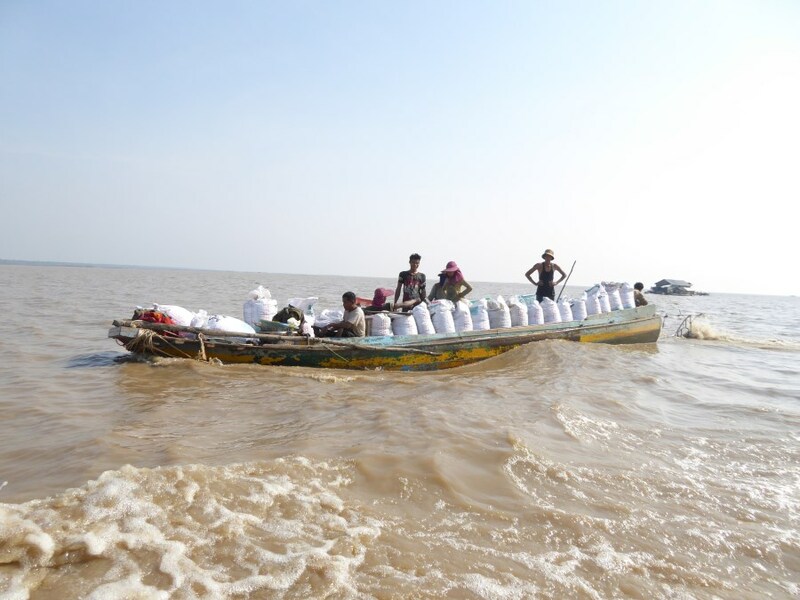 Wonderful photos and equally wonderful stories of really resourceful people–thank you both so much !